The Chevrolet Chevelle is a mid-sized automobile that Chevrolet produced in three generations for the 1964 through 1978 model years. Part of the General Motors (GM) A-body platform, the Chevelle was one of Chevrolet's most successful nameplates. Chevrolet was caught flat-footed when the muscle car market took off in 1964. That year, GM began prohibiting the use of larger than 400 cubic inch displacement engines in their A-body intermediate cars. In 1964, Pontiac had set the GM standard by using a 389 cubic inch Bonneville engine in its intermediate sized LeMans, but the largest engine Chevrolet offered for their new Malibu was 327 cubic inches. The big block Chevelle first appeared in 1965 as the “Z16,” a 396 cubic inch, 375-horsepower model that was limited to just 201 produced. In 1966, the SS396 became an option on the Chevelle to challenge the GTO, selling 72,272 units to Pontiac’s 96,946. The SS396 would continue through 1969 with the 396 engine as the only power plant, offered with one of three horsepower packages—standard 325 or optional 350 or 375 horsepower. For its 1970 models, GM lifted the 400 cubic inch ceiling on intermediates, and the four divisions producing muscle cars immediately dropped in their largest engines. Buick, Oldsmobile and Pontiac picked their 455 engines off the shelf, while Chevrolet chose to punch out its venerable 427 big block motor to 454 cubic inches and offered the hydraulic lifter LS5 rated at 360 horsepower and the solid lifter LS6. The LS6 used the same block as the LS5, but an 800-cfm Holley four-barrel carburetor bolted to an aluminum manifold replaced the Rochester Quadra Jet. The LS6 featured a beefy bottom end with four-bolt mains, forged steel crankshaft and connecting rods with forged aluminum, 11.25:1 compression pistons. Because of the LS6’s high (6500) redline, deep groove accessory drive pulleys were necessary. Thanks to new Federal emission standards, the LS6 was hobbled with the primitive Air Injection Reactor (A.I.R.) pump plumbed into the tops of the exhaust manifolds that injected additional air into the exhaust system. By doing so, it reduced the products of incomplete combustion (hydrocarbons and carbon monoxide) and further combustion occurred in the manifold and exhaust pipe in the presence of this oxygen-laden air. Only the Holley-equipped LS6 received the A.I.R. system, which was one of the first items removed by owners when they took delivery from the dealer. Either the Muncie M22 “Rock Crusher” close ratio four-speed manual transmission or the three-speed M40 Turbo Hydra-Matic automatic was available with rear end gear choices up to 4.33:1 and limited slip differential. This kit has been around for quite a while. My version was the mid-nineties AMT release. Molded in gray plastic, the major elements of the kit are on numerous sprues. The kit also contains clear plastic parts, rubber tires, and metal axles, clear parts and several chrome pieces. The decals provide two different striping options: black and white. 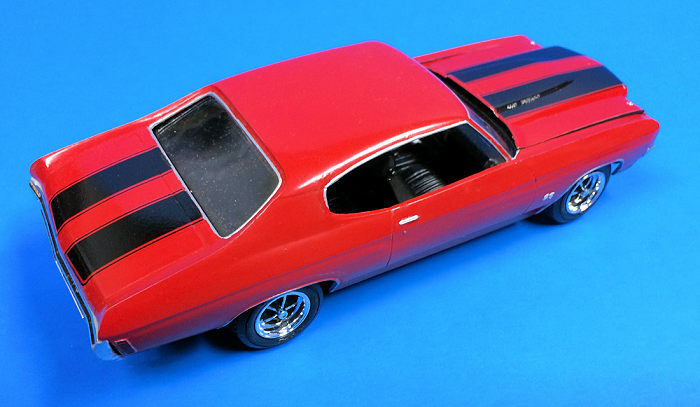 The instructions contain a nice chart that provides all the exterior and interior color selections that Chevrolet provided for the 1970 Chevelle. The chassis is molded in one piece, which simplifies the construction process. This is a simple kit, compared to some of the latest car and aircraft kits on the market. Most car kits start with the engine, and this one is no exception. The modeler can build either the stock 454 motor or a custom, fuel-injected, high rise manifold motor with custom headers. After assembling the engine, I hand painted the block Chevy Orange and the fan and pulleys with gloss black. I then used some telephone wire to represent the spark plug wires. I fashioned wire harnesses out of scrap plastic to provide some order to the engine wiring. I made the distributor out of brass tubing slipped over a smaller tube and then inserted all nine wires (eight spark plug plus the coil wire) into the open end of the larger tube. You can fill the open areas with white glue or some other filler once the wires are in place. This is a much easier solution to wiring a distributor in 1/25 scale than drilling individual holes in the kit’s plastic distributor. Once the engine was assembled, I moved on to the interior. I sprayed this with Testors flat black and then picked out chrome items with Testors Silver. I then dry brushed the gauges with flat white to pick out the instrument lettering. I also sprayed the chassis flat black and installed the lower rear axle, which I hand painted gloss black. I then glued on the exhaust system, which I painted with Testors aluminum. Once all this dried, I glued the motor onto the chassis and installed the headers. I love red cars, so I opted for a red SS 454. Once again, I chose Model Masters’ Gloss Guards Red, my go-to red for just about any gloss red paint scheme. I shot the body with this paint, and, once dried, I used a micro-mesh polishing kit to wet sand the body color. I finished this off by a final polishing using “The Treatment” model wax. If all of this is done properly, one need not use a clear gloss overcoat to get a shiny finish. I then installed the one piece clear window unit, using white glue to secure it to the body roof. Once this dried, I installed the interior into the body and glued it. 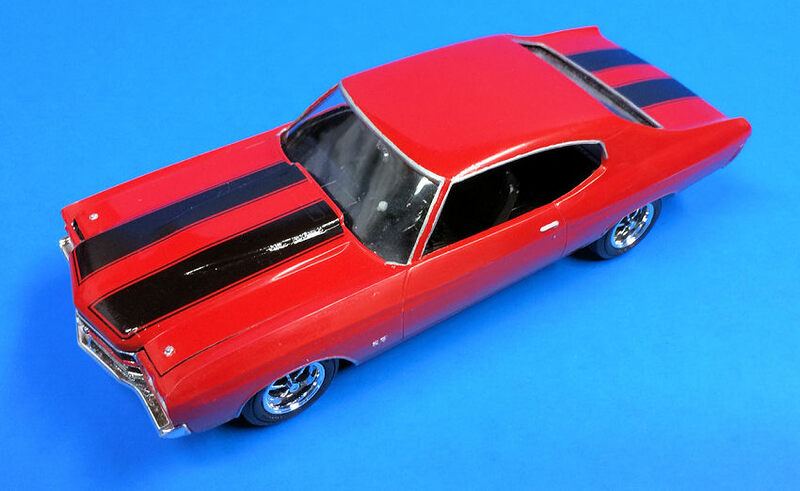 I chose to use the black striping decals, as this provides a “meaner” looking Chevelle, in my opinion. Given their age, the decals went on smoothly with sufficient decal setting solution. Once the decals dried, I picked out the logos on the body with Testors silver paint and painted the chrome trim. I then installed the chrome plated front and rear bumpers. As a final step, I highlighted the chrome plated wheels with flat black to represent the wheels on a real Chevelle SS 454. This is another great looking car kit from AMT. 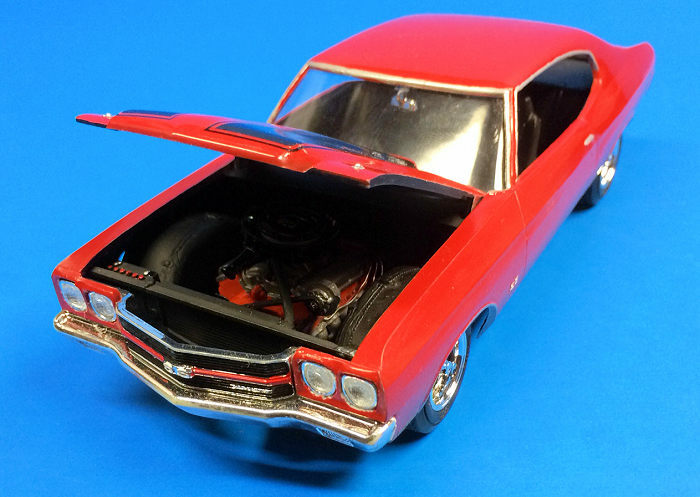 This is an easy build, and if you are into sixties and seventies muscle cars, you need to have one of these in your collection! The Ultimate Muscle Car - The 1970 Ls6 Chevelle, Heacock Classic, Worldwide Web, May 2017. Chevrolet Chevelle, Wikipedia, Worldwide Web, May 2017.